Your bathroom gets a lot of use. So when it's time to renovate, you want to be sure your bathroom remodeling project is done right. From small bathroom renovations to complete bathroom design and construction, Erix Home Improvement LLC will work with you and your budget to create your dream bathroom. Call (240) 207-1192 to speak to one of our bathroom remodeling specialists. We've been renovating bathrooms for 7 years. No job too small! With a little ingenuity and planning, you can give your bathroom a whole new look. Call (240) 207-1192, to speak with one of Erix Home Improvement LLC's bathroom renovation contractors. Whether your budget is large or small, bathroom remodeling by Erix Home Improvement LLC is an investment that pays for itself in a short period of time. If you're looking for a bigger change, install a walk-in shower or go retro with a claw foot bathtub. Even making a change in your flooring can give your bathroom a fresh look. Consider updating your backsplash for a more contemporary look. Add a ceiling fan or even a chandelier. The sky's the limit. Remodeling your bathroom adds value to your house. Whether your job is big or small, make sure the job is done right. 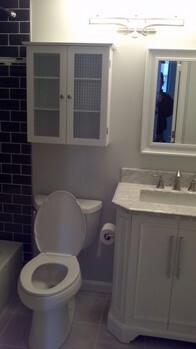 Call (240) 207-1192 to speak to one of our bathroom renovation specialists. Erix Home Improvement LLC guarantees quality work and attention to detail. Erix Home Improvement LLC has been in the home improvement business for 7 years, specializing in bathroom renovation.